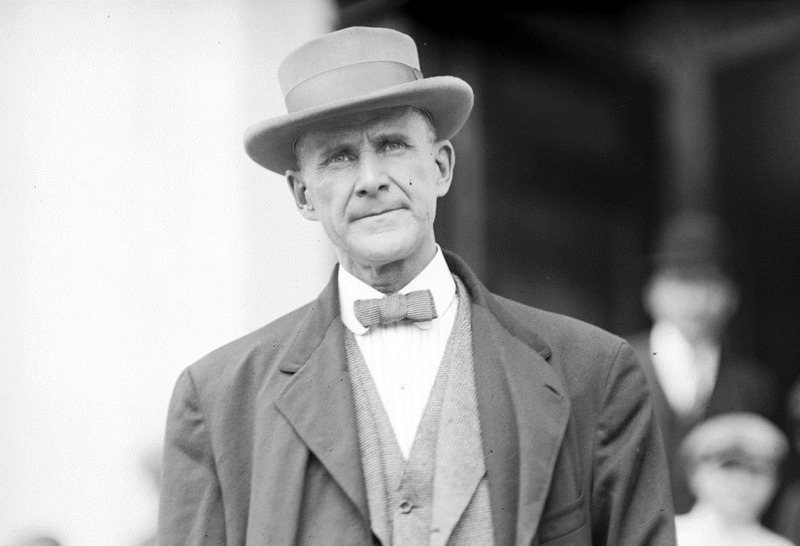 Seen above, 61 year-old Eugene Victor Debs is the perennial presidential candidate of the Socialist Party of America, a union organizer, and an ardent opponent of capitalism. He counts Vladimir Lenin among his fans in the international socialist movement which has been torn apart by the Great War. Without using his name, in the pages of today’s edition of the American Socialist newspaper Debs hails Lenin’s efforts to restore the solidarity of the Second International — and suggests that peace is just around the corner. There is no doubt that the belligerent nations of Europe are all heartily sick of war and that they would all welcome peace even if they could not dictate all its terms. But it should not be overlooked that this frightful upheaval is but a symptom of the international readjustment which the underlying economic forces are bringing about, as well as the fundamental changes which are being wrought in our industrial and political institutions. Still, every war must end and so must this. The destruction of both life and property has been so appalling during the eighteen months that the war has been waged that we may well conclude that the fury of the conflict is largely spent and that, with bankruptcy and ruin such as the world never beheld staring them in the face, the lords of capitalist misrule are about ready to sue for peace. This is terribly wrong. While both sides are indeed preparing to launch major offensives this year, the conflict itself has not even hit the halfway point. Furthermore, Debs considers the worldwide conflagration to be an artifact of the capitalist system, an assertion that actual capitalists find hysterically funny. Global financial markets have still not recovered from the Austrian ultimatum of July 1914, which shut down Wall Street in what remains the longest trading outage in its history a century later; only deft management, war bonds, and the new European demand for war material from American industries have thawed the frozen credit markets. Many of Debs’s criticisms of American capitalism are certainly valid: child labor, unsafe working conditions, wage slavery, and union repression are very real issues in 1916, but Wall Street and ‘capitalism’ are hardly responsible for the war itself. From the point of view of the working class, the chief sufferers in this as in every war, the most promising indication of peace is the international conference recently held in Zimmerwald, Switzerland, attended by representatives of all European neutral nations and some of the belligerent powers. This conference, consisting wholly of representatives of the working class issued a ringing manifesto in favor of the international re-organization on a permanent and uncompromising anti-war basis and of putting forth all possible efforts to end the bloody conflict which for a year and a half has shocked Christendom and outraged the civilization of the world. This is a reference to Lenin, whose small conference at Zimmerwald has raised a competing organization against the International Socialist Bureau, whose national delegations have splintered over the war question, choosing patriotism over class struggle. Debs then dives headlong into the magical thinking which pervades contemporary peace activism. The manifesto above referred to has been received with enthusiasm by the workers of all of the belligerent nations and the sentiment in favor of its acceptance and of the program of procedure it lays down is spreading rapidly in labor circles in the nations at war as well as in those at peace. This is a preposterous assertion. The sad reality is that socialist pacifism still has very narrow appeal in the combatant societies, and not merely because of censorship or propaganda, but because the people are genuinely angry. Nationalistic fervor has only deepened over time; chauvinism and hatred are now worse than when the war began, and this is in no small part due to the very same casualty lists which have shocked and appalled everyone. Put simply, from the perspective of each side, the deaths of millions are such a crime as can only be punished by the death of millions more. And Debs isn’t exactly calling for an immediate cease-fire, either, as he is less interested in ending the war than overseeing the destruction of the capitalist system he absurdly blames for its ourtbreak. It would no doubt do much to clear the situation and expedite peace overtures if a decisive battle were fought and the indications are that such a battle, or series of battles, will be fought between now and spring. But the opportune moment for pressing peace negotiations can be determined only by the logic of events and when this comes the people of the United States should be ready to help in every way in their power to terminate this unholy massacre and bring peace to the world. As to the terms upon which peace is to be restored these will no doubt be determined mainly by the status of the several belligerent powers when the war is ended. A program of disarmament looking to the prevention of another such catastrophe would seem to be suggested by the present heart-breaking situation but as experience has demonstrated that capitalist nations have no honor and that the most solemn treaty is but a “scrap of paper” in their mad rivalry for conquest and plunder, such a program, even if adopted, might prove abortive and barren of results. The matter of the conquered provinces will no doubt figure largely in the peace negotiations and the only way to settle that in accordance with the higher principles of civilized nations is to allow the people of each province in dispute to decide for themselves by popular vote what nation they desire to be annexed to, or to remain, if they prefer, independent sovereignties. Debs, who holds both Republicans and Democrats to be tools of the same capitalist overlords, is unaware that President Woodrow Wilson made a decision this month to undertake a peace initiative, sending his political fixer, ‘Colonel’ Edward House, to Europe in an election-year bid to bring the warring powers to the negotiating table. Nor can he foresee that Wilson will indeed press for the self-determination of subject peoples during the postwar peace conference at Versailles and call for a League of Nations to peaceably resolve differences in yet another example of American liberalism borrowing and transforming leftist fantasies into workable realities. Rather than look to compromise and incremental progress, Debs is convinced that permanent peace is only possible through total socialist control of the means of production. Debs will not run for president this year, choosing instead to run for Congress and losing badly to a Republican. Newspaper editor Allan Benson will run for the highest office in his place, focusing his platform on opposition to military preparedness, but garnering just half as many votes as Debs won in 1912. By 1919, the world’s financial center of gravity will have shifted permanently from London to New York, the United States will be on its way to global superpower status, and rather than become a major political force, the American Socialist Party will decline into irrelevance. Debs will be convicted of sedition for his speeches opposing the American war effort. Whereas before the war, the ASP held more than seventy mayors’ offices around the country, two seats in Congress, and many offices in state legislatures, with the war’s end the party will be virtually irrelevant. As the victorious powers set the terms for the next great global conflagration, Debs’s already-fractious party will be sundered again by a debate over Lenin’s Bolsheviks and their global leadership of a Third International. Lenin’s Russia will not bring global peace or an expansion of human rights; quite the opposite. Nearly six decades after Eugene V. Debs makes his final run for president from a prison cell, a young American socialist named Bernard Sanders makes a short documentary about his life. Now running for president himself, Sanders enjoys a very enthusiastic cohort of supporters, but questions remain about his ability to deliver on the revolutionary promises he makes. In that sense, his campaign truly is the all-American fulfillment of Debs’s legacy.